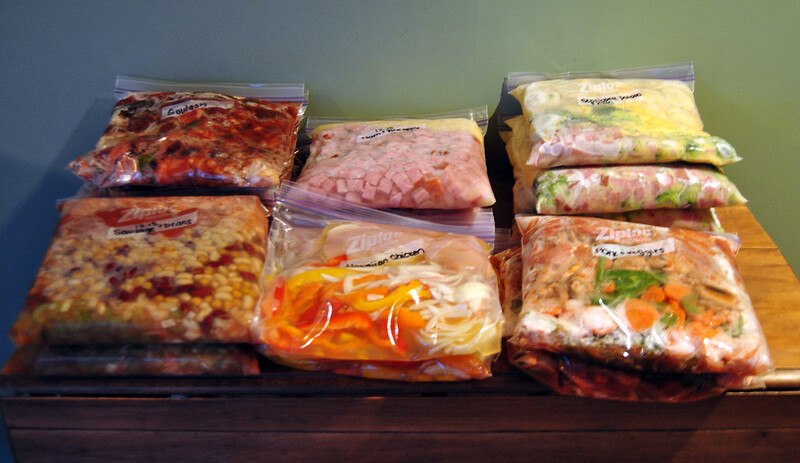 Quick and Easy Freezer Meals Mama Say What?! | Mama Say What?! I began to meal prep a couple of weeks before the arrival of Baby 2K. I did this for our family before M was born and it worked well for us. When you’re recovering from birth, breastfeeding, and adjusting to life with a newborn, cooking dinner for your family is not high on your list of priorities. And even if your husband or partner is happy to cook, it’s really nice to have a bunch of dinners all prepped and ready to eat. One tip I have for freezing any meal is to use disposable aluminum pans so you don’t tie up your nice Pyrex pans and baking dishes. I place all of my meals in a lightly greased or buttered aluminum pan, top them with plastic wrap and aluminum foil and then pop them in the freezer on a level surface. Then when I want to eat it, I take it out the night before and place it in the fridge. I like to bake mine thawed (if I can) because it cuts down on warming time. If not, simply bake the frozen entrée or side dish longer. Don’t forget to remove the plastic wrap! For other items like meatloaf, meatballs, any plain meat dish, and breads I pop them in a freezer safe Ziploc bag. I purchased some new Ziploc freezer containers to use later. I imagine they would work perfectly for foods you don’t need to bake. Here are some of my favorite freezer meals (in no particular order) and some that my mama friends suggested that I can’t wait to try. If you don’t see a link to the recipe or post from Mama Say What? !, keep an eye out as they will be coming later. Hashbrown Casserole. This is a go-to side dish for potlucks and family events. When I meal prepped for M, I made a batch and split it into two 8×8 aluminum pans. This is very easy and you can adapt the recipe to your tastes. Quick breads. I LOVE QUICK BREADS! They are my go-to for holidays because they are easy to make, you can make them ahead and freeze, and they travel really well. It takes us about three hours to get to my parents’ house and sometimes food just doesn’t make it there as beautifully as when you left your house. Quick breads do! My favorites are chocolate zucchini, pumpkin, cranberry, and banana bread. 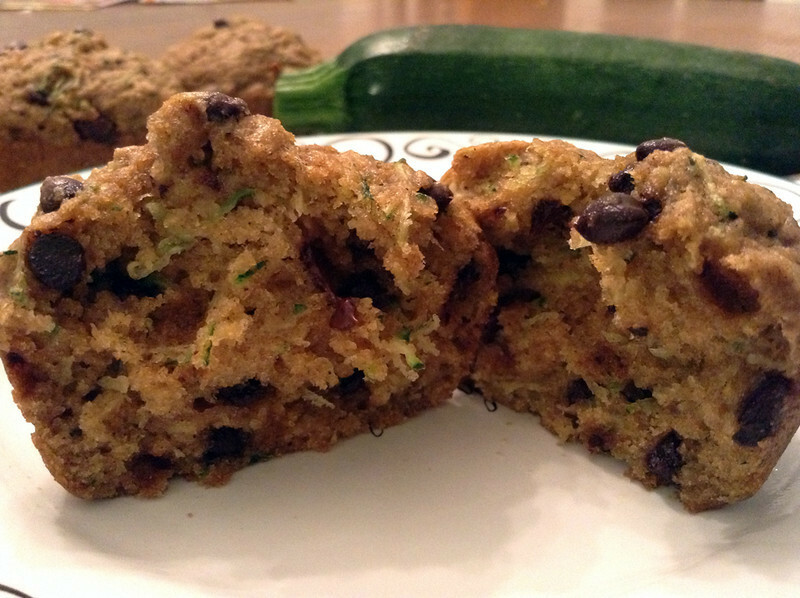 Check out Alex’s Maui-Style Banana Bread and Mary Ellen’s clean eating version of her Chocolate Chip Zucchini Muffins. She freezes them and takes them out to snack on one at a time. Chicken or Turkey Tetrazzini. All of my recipe books for chicken or turkey tetrazzini call for lots of creamed soup. I wanted to freeze something more homemade. I love The Pioneer Woman and I used her recipe for Turkey Tetrazzini. Warning though: either mine grew while I was cooking it or I underestimated how much it made. I ended up freezing two 13×9 aluminum pans. Needless to say, we had plenty of chicken tetrazzini to eat! Meatloaf. Meatloaf is an easy-peasy thing to make and throw in the freezer. You don’t even have to bake it if you don’t want to. If it is baked already, simply warm and serve. Meatloaf sandwiches are a yummy option too. This is another main dish that you can use many variations. A turkey meatloaf (or clean eating turkey meatballs via Mary Ellen) would be a perfect freezer main dish. Meatballs. 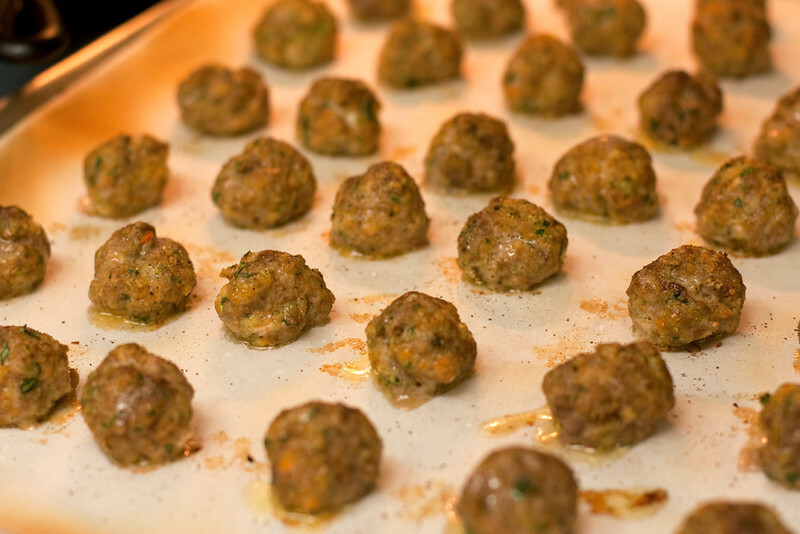 Similar to the meatloaf route are the delicious hidden veggie meatballs Alex makes for her family. Check out her recipe. Enchiladas. I made a super simple batch of freezer enchiladas. I honestly think any enchilada recipe would freeze well. This is the one my mama sent me so I tried it out. Plus, I shop at Aldi for most of our food so I had all the ingredients. Mama Alex did it again with her knock-it-out-of-the-park yummy White Chicken Enchiladas. Why I didn’t make these instead, I will never know. 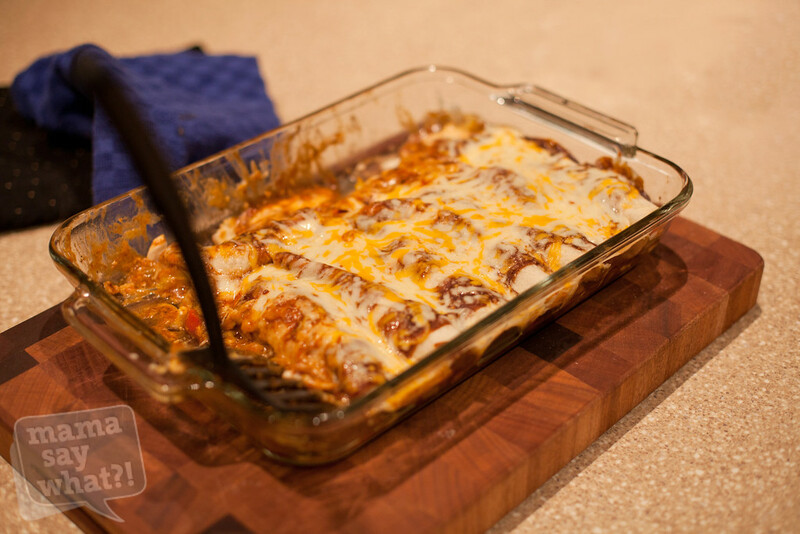 Also check out Danica’s recipe for Fajita Enchiladas. Italian beef. I sent this recipe to my mama friend when she asked for slow cooker and freezer meal ideas. I just throw it in a slow cooker and let it cook and serve on a hoagie or a Hawaiian Sweet Roll with provolone cheese. If I’m feeling fancy I’ll sauté some onions and peppers. Delish! Lasagna. 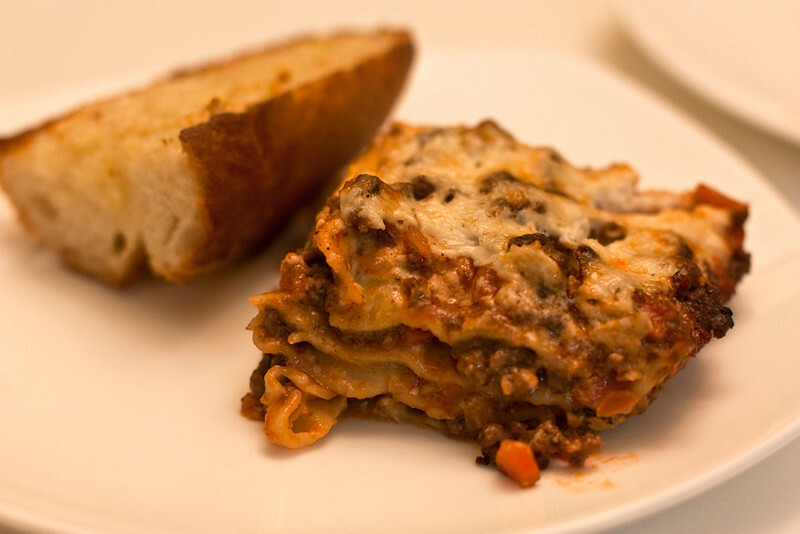 Mama Alex made a delicious Hidden Veggie Bolognese Lasagna that I can’t wait to try. I make the traditional or scaled-down version. A little unrelated, but since we are talking food here… One of my last days in the office we were talking about food and my friend April mentioned she wanted to make a ravioli cake. I was picturing lasagna style ravioli and told her how good a ravioli cake sounded. She actually said she wanted to make a red velvet cake. We died laughing about how my baby brain turned that into ravioli cake and how she thought it sounded disgusting because she was picturing an actual dessert cake with raviolis inside. Now that I think about it, why not use Alex’s recipe and instead of using traditional lasagna noodles use your favorite raviolis. Viola, a new recipe thanks to freezer food on the baby brain. Pizza bread- My cousin gave us freezer pizza bread for us to eat before M was born. It was very tasty. This is on my list of things to make. It would also be fun to make with your kids and eat that day. For even more freezer meals and ideas check out this post for your crockpot and beyond. I can’t wait to try these while I’m adjusting to being a parent of a two-year-old and a newborn. I’ll need all the help I can get! Eat up! Freezer Meals for Your Crockpot and Beyond! Added by Sarah K. on September 18, 2015. Hashbrown Casserole, Italian Beef, and Pizza Bread to come! We make meatballs and enchiladas all the time. When I make them for dinner, I double them and pop one in the freezer. Thanks for sharing! !